21st century video games are championed for interactive gameplay and in-depth storytelling. The games of the late 80’s and early 90’s could be crowned as mindless time wasters. That’s “Rampage” in a nutshell. How they made a movie out of that is genuinely impressive. One, because it should be towards the bottom of the list for potential big screen adaptations and second, there’s honestly not much to adapt other than the idea of giant monsters smashing buildings, something that’s already been done multiple times. “Rampage” is like a melting pot of any Kaiju film, “Mighty Joe Young” and that Dwayne “The Rock” Johnson charm we’ve become accustomed to over the past decade. Johnson plays beefy anthropologist Davis Okoye, who relates more to primates than he does his human co-workers at a San Diego wildlife sanctuary. The introverted scientist can fly helicopters, has a military background, and communicates with a massive albino silverback gorilla, named George, like it’s his frat brother. The movie quickly picks up steam when George is infected with an experimental gas. The mutating fumes are from the remnants of a company space station that was experimenting with DNA. The gas acts like a steroid to all of George’s senses, turning him into a monstrous creature overnight. He’s bigger, stronger and angrier. He’s not the only creature to get hit with a dose of plot as several other canisters of this harmful gas have landed in rural Wyoming and some Florida swamplands, infecting a wolf and crocodile. 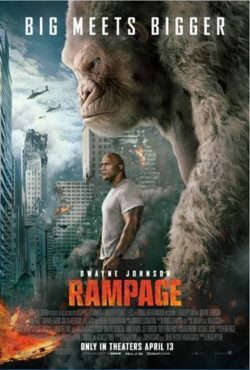 “Rampage” is a tad too long, padding it’s runtime with a lot of unnecessary character backgrounds, silly exposition, and a quick shoehorned message about poaching. It doesn’t help that the show stopping fight between all the monsters, in downtown Chicago, feels like it takes forever to get to. The pace that it moves at feels more like a painful tease rather than an actual build-up. Johnson, like he is in most of the other sub-par films he stars in, does give an otherwise limp noodle script a bit of life. When it wants to be light-hearted, “Rampage” is quite fun, but when it wants to be dark with jump scares, and scenes of death and destruction, it’s off putting to the overall vibe the movie’s trying to establish with George and his nurturing human savior, Davis. There’s fun to be had in “Rampage” as long as you understand that this is a bad movie. But just like the old “Rampage” arcade game I played in my youth, I don’t necessarily feel like I should ever revisit this one or reflect on it as anything more than a cash grab.